Particularly amazing is how McMillan was selected by the Reds. He attended, without an invitation, a try-out camp in McKinney, Texas, in 1947 at age 16. The camp was sponsored by the Reds’ Tyler, Texas, minor league franchise and conducted by Red scout Hack Miller. Before the tryout camp, McMillan had played in only one baseball game, a pickup game when he was 10 years old. At the tryout camp, Roy saw a curve ball for the first time. He fielded hardballs for the first time. Yet Hack Miller saw Roy’s sure hands and athletic ability, especially his ability to catch the ball on the half hop instead of dropping back for the easy bounce. In 1947 he was assigned to the Ballinger, Texas, team in the Class D Longhorn League, where he batted .275 in 107 games. With the Tyler club of the Lone State League in 1948 he hit .302 and was spotted by Branch Rickey, who brought him to the attention of the Reds’ front office. Rickey offered $40,000 for the Class C shortstop with only one year’s baseball experience. Reds general manager Warren Giles turned down the offer but put a big asterisk after McMillan’s name on his prospect list. In 1949 Roy moved to the Columbia club in the Class A Sally League where despite his .232 batting average and a broken ankle he received optimistic reports regarding his chances of making the majors. Moved up to Tulsa club, in the top-flight Texas League in 1950, he improved his batting average to .274 with 51 runs batted in. Sportwriters and fans called him “Radar,” “Scoop,” and “The Boy Bandit.” To this day people who remember him still consider Roy one of the best shortstops ever to come out of the Texas League. Elevated to the Cincinnati Reds in 1951, he saw little action with a .211 batting average, while Virgil Stallcup was the starting shortstop. Reds manager Luke Sewell was not happy with Stallcup’s performance and decided to cast his lot with McMillan in 1952. In his first 52 times at bat, he accumulated exactly 2 hits. Yet Sewell stuck with his decision and was rewarded when Roy played in all 154 games with a surprising .244 batting average, 7 home runs, a team-best 32 doubles and 57 runs batted in. And he fielded with expected excellence. From his first game he began to set records and played in every Reds game, 584 of them, until August 7, 1955, when a sore thumb took him out of the lineup. He would lead the National League in fielding percentage four times, putouts three times, assists four times, and double plays four consecutive years from 1953-1956. Johnny Temple joined the Reds in 1954 and from then through 1959 with McMillan became the second longest double play combination in the NL since 1900. (The longest was Joe Morgan and David Concepcion of Cincinnati’s Big Red Machine in the 1970s.) He played in 150 or more games in eight different seasons--six in a row. The Reds’ best finish during McMillan’s years was 1956 when they finished third with a 91-63 won-lost record. Their only other winning season was 1957 with a fourth-place finish and a 80-74 record. Throughout the 1950s the overwhelming press coverage of the Reds, both local and national, centered on their “wrecking crew” roster of sluggers that included Ted Kluszewski, Wally Post, Gus Bell, Ed Bailey, George Crowe, Frank Robinson, and Vada Pinson. In 1956 the Reds hit 221 home runs, far ahead of any other club, and tying the 1947 New York Giants’ major league record to that time. Rookie Frank Robinson led the way with 38, and Roy McMillan’s three home runs helped the team tie the record! At season’s end when the Cincinnati Baseball Writers Association was preparing to announce their recipient of their Reds Most Valuable Player award, sportswriters’ talk centered on Ted Kluszewski and Frank Robinson. 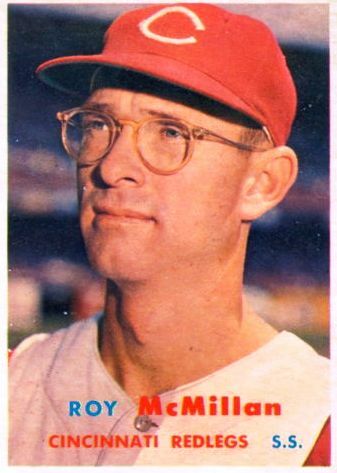 But they named Roy McMillan with his meager 3 home runs the Reds’ MVP in 1956. Their recognition of the value of superb defense was supported across the baseball world when Roy was ranked sixth in the NL Most Valuable Player voting, the highest of any Reds players, including Robinson and Kluszewski, in that 1956 season. Reds general manager Gabe Paul agreed with the decision and signed McMillan to a two-year contract, the first such contract ever given by Paul. National recognition of Roy would continue when in 1957 The Sporting News named him to their All-Star Fielding team and recipient of the Rawlings Gold Glove Trophy Award in the first year the award was made. Roy would receive that award again in 1958 and 1959. He was elected to the National League All-Star team in 1956 and 1957. Roy was not a one-dimensional player. He had his moments as a hitter. In the 1956 All-Star game, he went 2-for-4 in the National League’s 7-3 win. On September 21, 1957, he hit a two-run home run off his landlord, former Red Herm Wehmeier, in the tenth inning of a 9-8 Reds win over the St. Louis Cardinals. It was his only home run in 1957. Coincidentally, McMillan had rented Wehmeier’s home in Westwood, a suburb of Cincinnati, the previous summer. On April 20, 1960, Roy had his biggest offensive game, 5 hits, 2 home runs, 5 RBIs in a win over Milwaukee. In the search for better pitching, the Reds traded McMillan to the Milwaukee Braves for pitchers Joey Jay and Juan Pizzaro on December 15, 1960. After three seasons with the Braves, he completed his major league career with the New York Mets from 1964 to 1966. He played in 157 games at age 35 in 1965 and started a triple play in a 23-inning marathon game against the San Francisco Giants in 1964. After serving as player-coach for Jacksonville, in the Florida International League, in 1967, McMillan managed Visalia (California League) in 1968 and with Pete Pavlick and John Antonelli piloted Memphis (Texas League) to a division and league championship in 1969. For his efforts he was named Eastern Division Manager of the Year. He returned to the major leagues as coach with the Milwaukee Brewers from 1970 to 1972 and the New York Mets from 1973-1976. He served a brief stint as interim manager with the Milwaukee Brewers in 1972 and replaced Yogi Berra as the Mets manager for 53 games in 1975. McMillan completed his baseball career managing in the Minnesota Twins’ minor league system from 1977 to1980 and as a Texas area scout for the Montreal Expos from 1982 to 1997. Roy McMillan was inducted into the Cincinnati Reds Hall of Fame in 1971, the only inductee that year. Roy McMillan died from a heart attack at the Northeast Medical Center in Bonham on November 2, 1997. He is buried in Willow Wild Cemetery in Bonham. Creamer, Robert. “Wreck of the Redlegs.” Sports Illustrated, September 9, 1957. Lee, Bill. The Baseball Necrology: The Post-Baseball Lives and Deaths of Over 7,600 Major League Players and Others. Jefferson, NC, and London: McFarland, 2003. Linn, Ed. “Next Year’s Team: The Story of the Cincinnati Wrecking Crew.” Sport, February 1957. Meany, Tom. “The Best Infielder in the Majors.” Collier’s, May 27, 1955. Olderman, Murray.. “Roy McMillan, The New Mr. Shortstop?” Sport, May 1953. “The Cincinnati Reds.” Sport, June 1957.